COMPOSITES EUROPE 2017, the 12th European Trade Fair & Forum for Composites, Technology and Applications takes place in Stuttgart, Germany from 19 – 21 September 2017. Reinforced Plastics takes a look at some of the companies exhibiting at the show. For more exhibitors, please see the Composites Europe website. Email: RP@elsevier.co.uk to make sure your company features in the next Conference Showcase. With over more than 20 years’ experience and a good international network, our goal is to provide effective solutions designed to boost your business, be it small or a large organization. Our design solutions tailored specifically to the needs of your business in order to ensure you achieve your success. We focus to manufacture custom made profiles. This doesn’t mean that we are not interested to manufacture standard profiles but lots of standard profiles already made by the competition and we believe that this market is well developed. We have experience to produce with all kinds of fibre like glass, carbon, basalt and aramid and different kind of resins as polyester, vinylester, epoxy etcetera. Our R&D team is also looking at the possibility for the future to work with thermoplastics composites. Based in the centre of the Netherlands, Zeewolde, we are perfectly located to distribute. Off course are our Customers not only from the Netherlands. We supply all over Europe in various markets like Automotive, Infrastructure, Petrochemical, Sport & Leisure, Building & Construction and many more. Cannon is an international Group supplying a wide range of industries with dedicated engineering solutions. From the 1960’s the Company has been leader in manufacturing dispensing machines for Polyurethane foams. Cannon offer includes a complete range of plants and machines for continuous and discontinuous processing of Polyurethanes and other polymers obtained by chemical reaction, providing solutions to its customers all over the world. During the years, the Company has diversified its business into synergistic fields, within and outside the plastics processing technologies. Today, the Group supplies equipment for composite materials, thermoforming, aluminum die-casting, industrial electronic controls, industrial boilers and water treatment plants. Cannon Group provides the Composites industry with its entire experience in terms of engineering solutions and manufacturing of state of the art equipment. Every Cannon division is specialized through years of experience in a specific stage of the CFRP technology, making the Group able to deliver turn-key customized plants to its customers, giving them a final and certain result. a dedicated robot control tool – RPI – specifically developed for composites manufacturing processes that revolutionizes the way robots are programmed and drastically reduces programming times. At Composite Europe 2017 Cannon will present its dedicated solutions for different Composites technologies, including HP-RTM, T-RTM, Pultrusion and SMC. Cevotec sells the first production solution for carbon composites that works with fiber patches, enabling manufacturers to build complex composite parts in high volumes and superior quality. Cevotec sells the first production solution for carbon composites that works with fiber patches, enabling manufacturers to build complex composite parts in high volumes and superior quality. As the key technology partner, Cevotec develops production systems, CAD-CAM software and offers development services for prototypes and serial products. Successfully launched as the first industrial Fiber Patch Placement (FPP) system at JEC World 2017, Cevotec’s SAMBA sets new standards for the automated production of challenging 3D geometries and laminates with complex fiber orientation. 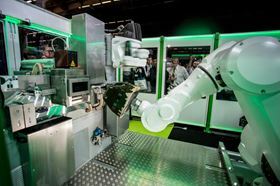 Visitors at Composites Europe, Stuttgart, will have the opportunity to experience SAMBAs operating mode in detail in Virtual Reality (VR) environment: SAMBA uses a pick-and-place robot with a flexible patch gripper to precisely place defined fiber patches on a 3D mold mounted on a tool manipulation robot. This allows for a discrete orientation of each patch and eliminates scrap as well as additional forming processes through additive, 3D net-shape preforming. Through the individual orientation of every patch along load paths, mechanical properties like stiffness and strength improve up to 150%, while the additive patch technology saves up to 30% of the precious fiber material. SAMBA comes with a matching CAD-CAM software platform: ARTIST STUDIO combines multiple, perfectly aligned modules for digital product development with Fiber Patch Placement technology. The Module PATCH ARTIST generates patch-based high-performance laminates with variable fiber orientation and laminate thickness based on standard CAD files. The results are visualized, quality-inspected and easily modified if necessary. Through the integrated patch optimization along direction-variable load paths, remarkable improvements in mechanical properties are achieved – especially for complex geometries. The generated patch laminate is immediately available in the module MOTION ARTIST, which enables an automatic offline programming of the SAMBA robots. The preparation time for production is significantly shortened, as changes and modifications in the patch-book are directly converted to new machine data. The built-in collision detection and visual process simulation also increase the safety on the shop floor. Further modules, including interfaces for CAE, will be released soon. Chromaflo Technologies is the leading independent global supplier of colorant systems, chemical and pigment dispersions serving the thermoset, architectural and industrial coatings industries (Image courtesy of Shutterstock). Chromaflo Technologies is the leading independent global supplier of colorant systems, chemical and pigment dispersions serving the thermoset, architectural and industrial coatings industries. Our diverse technical and custom manufacturing capabilities provide color solutions to meet the most complex requirements. A broad range of organic and inorganic pigment dispersions for the different chemistries and applications in the thermoset plastics market in EMEA is offered. 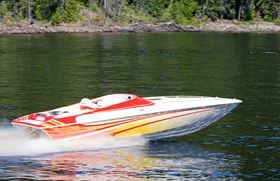 Color solutions can be provided for polyester, polyurethane, epoxy and plasticizer based products or processes. As experts in color development and chemical dispersions, we customize products to fit your unique requirements. One of our added values is assisting you to select the right pigment dispersion based on your requirements, to achieve the best balance between cost and performance. Join us at the event to learn more about our new range, the Plasticolors GTS line for gel coats. These colorants provide greater color flexibility and ensures accurate production of colored gel coats. The colorants contain highly durable organic and inorganic pigments, dispersed in a monomer free, unsaturated polyester carrier resin. GTS colorants are developed for use as a tinting system in volumetric and gravimetric dispensing machines. The four strongest organizations in the German fiber composite industry founded a joint umbrella group on the 18th of July 2013: In the future they will form the trade association “Composites Germany”. Founding members of Composites Germany, headquartered in Berlin, are AVK- Federation of Reinforced Plastics e.V. (AVK), Carbon Composites e.V. (CCeV), CFK Valley Stade e.V. (CFK-Valley) and Hybrid Lightweight Technologies – A working group within VDMA (VDMA). The purpose of the new umbrella organization is to strengthen the German composite industry particularly in the field of research, to determine common positions and to take overlapping interests into account. The member organizations keep their independence. Especially for the future oriented themes high performance composites and automated production technology which are particularly relevant in Germany, the power will be bundled. The automated mass production of composites is a key technology for lightweight construction in German industry. In our role as the industrial federation "Composites Germany" network, we are the voice of the composite industry, combining interests and creating synergy along the complete value creation chain. We support and promote the constant development of energy- and resource-efficient processes and products, in order to use the extraordinary innovation potential of composites, leading not only the traditional but also the top-class performance applications to their final breakthrough. With over 35 years' experience, Creative Composites is the UK’s most advanced composites manufacturer, at the leading edge of what can be achieved with composites, supplying innovative products for demanding applications through outstanding engineering design, unrivalled manufacturing capability and first class customer service. Creative Composites serves global OEMs and blue-chip companies in a diverse range of industries with composite materials which have advantageous properties over traditional metals and plastics and is ideally placed to supply innovative, light-weight, cost-effective solutions to market-leading manufacturers across Europe. Granta Design will be presenting its solution for high-performance engineering enterprises that face complex composite data management challenges. Supporting a rigorous, auditable and fully traceable composite qualification process, GRANTA MI™ provides organizations with full and intuitive control over their in-house materials data. It is an essential information management system for testing, qualifying or designing with composites. Combining your proprietary composite data with analysis tools and access to trusted reference data compiled from specialist libraries (e.g., CMH-17, NCAMP, AGATE) enables you to manage and use composite information from testing, QA, research and design. Granta works in partnership with companies like Boeing, NASA, Lockheed Martin, and Honeywell Aerospace as part of the Materials Data Management Consortium (MDMC) to develop software to manage critical materials data. In-house data can be validated against reference data, reducing errors and delays in the qualification process, and protecting valuable corporate IP through the capture of all aspects of your composites knowledge. This knowledge can be applied to ensure better decisions are made during product development, and to minimize risk of failure. Additionally, Granta’s CES Selector™ provides powerful graphical tools to compare material properties, support material selection, and model properties of hybrid materials. Engineers can also predict the performance of novel materials and structures. Composite producers can analyze the materials market, compare products, identify opportunities, and present the benefits of their products. Time savings, minimized risk, and streamlined processes are just some of the resulting benefits for anyone who uses or produces composites. If you would like to arrange an appointment in advance, please email us at info@grantadesign.com and we will ensure the appropriate Granta expert is available at a convenient time for you. HP Composites is Europe's leading manufacturer of carbon fiber reinforced composite products, with 870 frames produced from 2010 to today. The group is led by President Jacques Nicolet, entrepreneur and formula endurance driver, and passionate about cars; and managed by Abramo Levato, General Manager. The headquarter is in Ascoli Piceno and the company is considered an excellence in the industrial sector and above all in the Marche region. The company has 2 facilities of 9000 sqm. And a third production hall of 4,500 square meters is being planned, which will allow the structure to reach a total of about 14,000 square meters. Turnover grew by 27% compared to 2015 by 27% closing the 2016 budget with a 24 million euro turnover. The increase in numbers was flanked by the increase in resources, reaching an average of 250 people with 360-degree peaks. The objective is to position itself exponentially in the mass production market, while maintaining the leadership in the motorsport market. For this reason, the R & D department plays a fundamental role as having mission to conceive and carry out processes, in addition to materials, more and more efficient through the development of innovative techniques. Investments in R & D are continuous in economic terms, devoting approximately 4% of annual sales to the department and human resources. The company is able to respond to any request from customers such as Porsche, Dallara, Michelotto and Ligier etc. through the use of advanced equipment such as: Autoclave for polymerization, RTM technology (Resini Transfer Moduling) and Air Press Moduling. This exclusive technology developed by R&D allows to achieve high numbers of bodywork pieces while maintaining competitive costs and leaving the performance of the final product unchanged. The HP Composites' structural components are present in all major national and world championships, Formula E, Le Mans Prototypes (LMP) with LMP1, LMP2, LMP3 and GT3, GTE, Formula 4, FR 2000, WRC (World Rally Championship) etc. The desire to grow and experience led him to give life to a new start-up dedicated to the research of new technologies on advanced composite materials: Carbon Mind. The training school comprised of Ecodime Italia and TCA (The Composites Academy), which was born to offer an exclusive training plan, has over time become a national and international reference point for carbon fiber companies. INEOS Styrolution, the global leader in styrenics, will present StyLight®, the new generation of thermoplastic composites, at the 12th Composites Europe Trade Fair and Forum for Composites, Technology and Applications in Stuttgart, Germany. The new composite combines structural stiffness with surface aesthetics opening up opportunities in the automotive industry to address both, structural and aesthetic demands with a single material. This results in designers rethinking the design of certain vehicle applications. 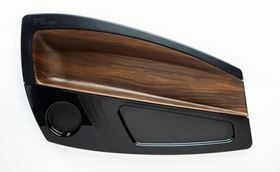 Traditional car applications often consist of a frame or structural part that is complemented by visible parts providing a certain aesthetical value to the user. StyLight offers an excellent mechanical performance profile including stiffness, strength and impact strength. It is on par with today’s most advanced PA6 or PP based thermoplastic composites in the market. At the same time, the material is capable of combining the roles of structural frame and visible aesthetic part. This leaves room for design changes and ultimately weight reduction. Integrating structural and aesthetic functions reduces the number of components for a given application and system cost. Automotive central console: This application is also very demanding with a directly visible surface, supporting electronic equipment and providing local structural stiffness. Moreover, the space available inside a console is very tight. It should allow space for the wire tree and storage space. Here again a thin wall providing structural stiffness and offering a high surface quality is offering potential for the integration of multiple functions. Body panel for trucks or tractors: A massive weight reduction is possible with the replacement of thick SMC panel currently being used in this field. But this application is more demanding than initially expected. Dimensional stability, class A surface quality, wind resistance, resistance to powerful vibrations are among the long list of specifications. Some of these panels also integrate functions like front light or bonnet. Here, StyLight may again have a good value proposition to reduce weight. 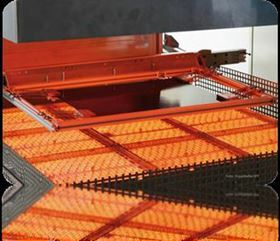 For more than 40 years, KRELUS have been specialists in Infrared-heaters. Heating of composite materials from carbon-/glass-/natural-fibres containing a matrix of PP/PA/PEEK/etc. The superior KRELUS technology applies direct radiation heat from its resistance source to the product. High thermal insulation materials prevent heat loss from the reverse side of the heaters. The rapid response time of KRELUS medium-wave IR-heaters allows operations with precise temperature control on the product surface ON and OFF even for short production breaks. This leads to highest efficiency in the field of IR-heaters. OCSiAl is a hi-tech company producing, on an industrial scale, TUBALL™ single wall carbon nanotubes – an advanced additive that improves the properties of base materials. The dominance of nanotubes is related to their exceptional properties, such as superior conductivity to weight ratio, high temperature resistance, strength and length to diameter ratio (>2500). Contrary to other conventional additives such as conductive carbon black, carbon or metal fibers, TUBALL™ nanotubes gain traction starting from extremely low concentrations of 0.01% significantly reducing impact on colour, mechanical and rheological properties of materials. Being introduced in material matrix TUBALL™ single wall carbon nanotubes create a 3D network that provides material with uniform and permanent conductivity and enhances its mechanical properties. TUBALL MATRIX 203 for solvent-based epoxy and solvent-based polyurethane systems. The company will also demonstrate specially developed ready-to-use components, such as TUBALL™ PAPER. This durable ultra-light material, designed for applications where high conductivity and low weight are of crucial importance, has already attracted attention from the aerospace and automotive industries. 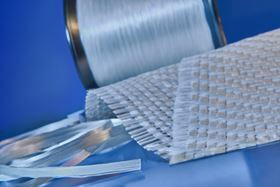 In addition to developing a wide range of industry-oriented concentrates, OCSiAl is taking the lead in increasing the transparency of nanotube management and has boosted the industrial use of nanotubes by registering TUBALL™ in accordance with the EU’s Registration, Evaluation, Authorisation and Restriction of Chemicals (REACH) regulations in September 2016. This registration supports the mass utilization of SWCNTs in many industries. OCSiAl is the only company allowed to produce and commercialize more than 1 tonne of SWCNTs in Europe annually. At Composites Europe 2017 PHP Fibers is going to present its Enka® TecTape hybrid roving. At Composites Europe 2017 PHP Fibers is going to present its Enka® TecTape hybrid roving. Enka® TecTape hybrid roving combines twist free aligned continuous glass fibers with thermoplastic multifilaments. Contrary to so called commingled hybrid rovings Enka® TecTape hybrid roving has a smooth tape-like structure with constant ratio of reinforcement and matrix material. Moreover, it is produced in constant width and thickness. Enka® TecTape hybrid roving shows the required flexibility and enables the manufacture of complex textile based reinforcements. The short distance between reinforcement fiber and thermoplastic fiber provides short cycling times during the conversion of the hybrid-based textile into a composite. Different to composites based on thermoset resin, composites with thermoplastic matrix can be post-formed - as it is already known from organo-sheets - and can be further enhanced by tape welding or injection moulding. Enka® TecTape hybrid roving is the raw material for the fully automated production of continuous fiber reinforced composites that combines the advantages of conventional hybrid rovings with those of already consolidated tapes. PHP Fibers (a subsidiary of Indorama Ventures (IVL) in Thailand) is one of the leading suppliers of high performance yarns in the automobile sector. Our high-quality industrial polyamide and polyester filament yarns, produced at our manufacturing locations in Europe, the USA and China, are used in a variety of areas such as airbags, safety belts, reinforcements in tire design or even in drive belts and hoses. The portfolio also includes special types for other challenging technical areas of application such as roofing and sealing membranes, textile construction, sail cloth or sewing threads. Our brand names Diolen® (PET), Enka® Nylon (PA 6.6), Enkalon® (PA 6) and Stanylenka® (PA 4.6) are known around the world and are well-accepted. After the merger in May 2017, the new Polynt-Reichhold Group is a global company in Intermediates, Coating and Composite Resins, Thermoset Compounds, Gel-coats and niche Specialties. The combination enhances the leading position as a global vertically integrated specialty chemicals player, with significant global presence in Europe, Americas and Asia with 44 production plants and more than 3000 people worldwide, with best in class innovation and a customer oriented approach. The Polynt-Reichhold Group uses the most advanced production technologies and state of the art laboratories to supply customers with innovative high quality products such as the ADVALITE™ Vinyl Hybrid Resins product line and NORPOL® Ultimate, a gelcoat with ultra low emissions and odour. SGL Group will showcase its expertise across the entire composites value chain, including new duroplastic and thermoplastic materials, as well as component exhibits featuring Volvo leaf springs and a CFC crossbeam. SGL will also present its latest development in the area of composites: bicycle components made with carbon fiber TowPregs, produced in collaboration with AMC (Automotive Management Consulting) using their proprietary technology called “xFK in 3D”. 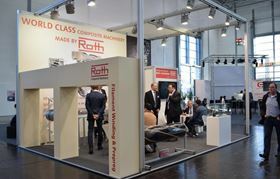 Roth Composite Machinery exhibits at Composites Europe in Stuttgart 2017. Roth Composite Machinery plans, designs and manufactures aggregates, machines and entire production lines across the business areas „Filament Winding & Prepeg“, „Pleating & Coating“ and „Brushes & Brooms“. The product range of the manufacturer with head quarters in Steffenberg, Germany includes machines for filament winding. This is a process to manufacture products made from high-quality plastics that are particularly robust thanks to fibre reinforcement, to be used in lightweight construction applications. In particular, these are used in the automotive and sports industries, in aerospace and in wind turbines. Synthetic resin or thermoplastic materials are processed on these machines and systems using reinforcing fibres, usually made from glass or carbon. Prepreg systems are used to manufacture composite fibre semi-finished goods that can be further processed and made into finished products in subsequent stages using the preimpregnated (hence the term prepreg), partially set thermoplastic matrix. Roth Composite Machinery offers solutions tailored to the customer’s requirements. This is rounded off with a high level of quality and technological capability as well high-performance, reliable and durable machines as a result. Roth Composite Machinery arose from the merger of the special-purpose machine designers EHA and Schlesinger. The manufacturer belongs to the family company Roth Industries GmbH & Co. KG with approximately 1250 employees worldwide. Roth Industries is one of the most innovative companies in building and industrial technologies. VABATEC ® GmbH with headquarter in Munich, develops, produces and sells vacuum auxiliary materials for the production of composite components. VABATEC ® GmbH with headquarters in Munich, develops, produces and sells vacuum auxiliary materials for the production of composite components. VABATEC is a supplier in the wind energy market, the automotive and the marine production as well as in the aerospace industry. Our materials are in use in the resin film infusion, in the autoclave technology and even the curing of composite components in oven. as well as various other items used in the production of components in the infusion or Prepreg techniques. In the show we will present our new 150°C release film (perforated and non perforated) as well as some new value added infusion systems with very high cost saving potential. VABATEC stands for excellent and reproducible product attributes, dependable delivery, an attractive cost-performance ratio, reliable products, first class technical support, and the continuous development of our products and services. Our goal is to further develop and strengthen our foothold in the composite market in the field of vacuum films and auxiliary materials. Through our high standards of quality, a high degree of service and an even higher customer satisfaction, we will achieve this goal. Highlighting new innovations in industry.